Hi everyone, sorry I have been absent for a while. My modem broke and the only way of keeping in touch with the outside world for me was my mobile phone, and I needed to keep my limited data in check until I got my new modem from the internet provider. I am now back online with a new shiny modem! And I have a few posts prepared for you for the upcoming weeks. 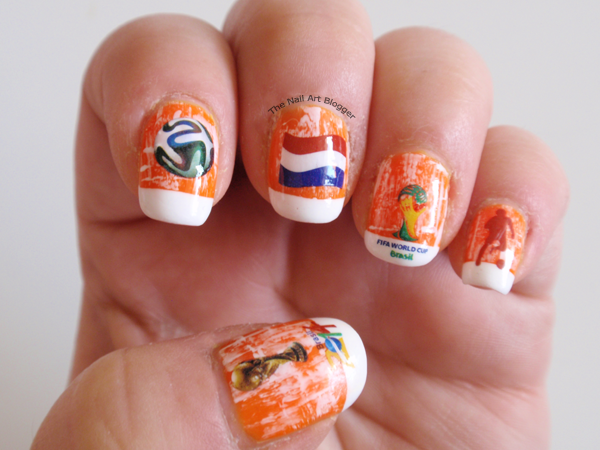 Almost everyone around the world is following the 2014 FIFA World Cup in Brasil. 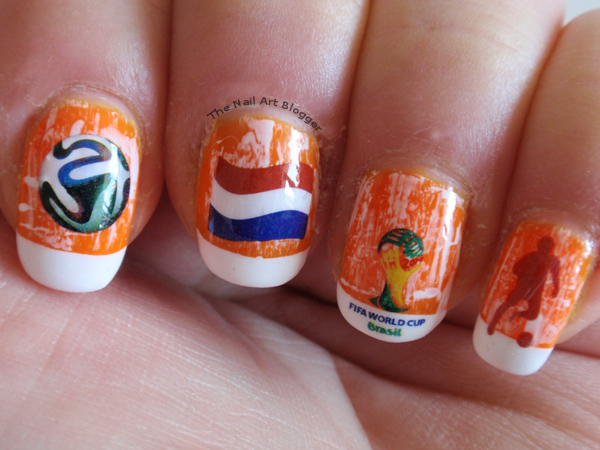 Nail artists have been showing their creations since the beginning of this world-wide event. 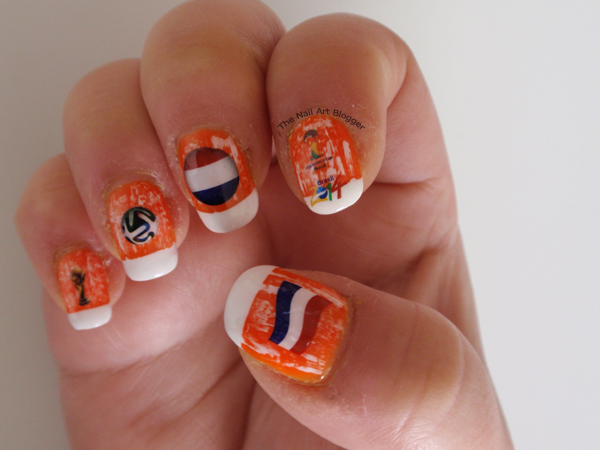 Some creating designs to celebrate the World Cup as a whole, and others in support of their national teams. 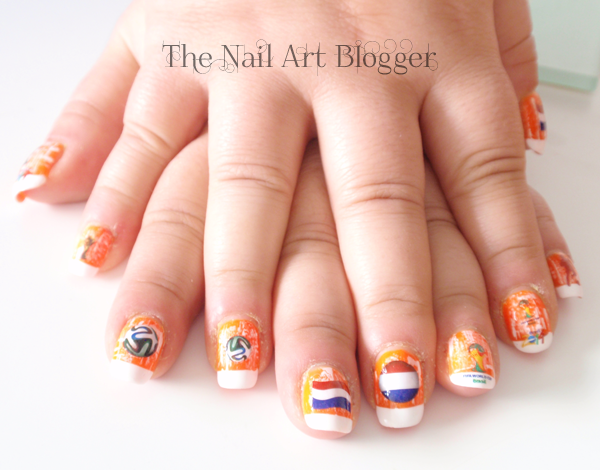 I, as well, have decided to show my support of our national team: The Netherlands. Unfortunately the Netherlands didn't make it to the final, but we are all still proud of our team for getting so far into the championship. For this design I used water decals I purchased from the Born Pretty Store. They are very easy to apply, and if you feel that you aren't good at creating freehand designs, or if you don't have enough time for creating a design, water decals are very helpful in such situations. - Neon orange, unfortunately I don't have the brand or color name, but I think the brand is called ddonna. I'm not quite sure anymore because it's a refill bottle and it has no name on it. I started off by painting my nails orange, and then painted the tips white with the help of a striping tape. After that I used the dry brush technique to create a grunge look using the same white polish. Once my nails were dry, I applied the water decals and topped it with a layer of top coat. This design was very easy to make, and I had a lot of fun doing it. The orange is so bright that it caught everyone's attention wherever I went. 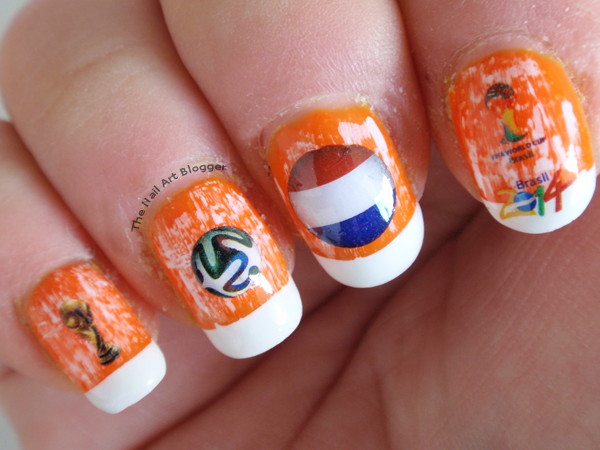 Have you had your nails painted in support of your favorite team during the FIFA World Cup? Let me know in the comments!